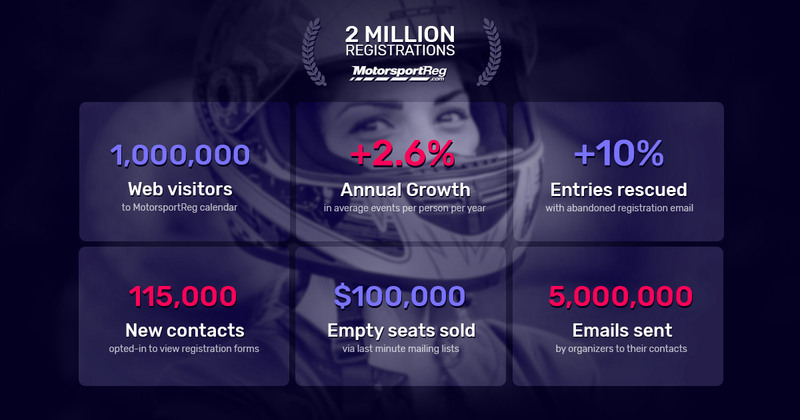 To all the organizations who trust MotorsportReg, you just hit a major milestone years in the making: we processed your 2 millionth event registration! This milestone is no small feat. Two million participants have lived out their passion for motorsport through an event that you've organized. We congratulate you on your contribution to the sport and for creating a place for all of us to get our adrenaline fix and create lifelong friendships. Your events reached more than 1,000,000 web visitors on the MotorsportReg calendar and 1,300,000 inboxes via our monthly "Upcoming Events" emails. You brought back 10% more people to your registration form using our abandoned registration emails that detect when someone leaves the registration form. You filled over $100,000 of unsold seats using our Last Minute Track Junkies list, growing your contact list and keeping your events financially in the black. You added 115,000 new names when people opt-in to your contact database before they view your registration forms. You sent your members and customers 5,000,000 emails keeping them up to date and encouraging them to register for your events. Five million touch points! All combined, our tools with your passion have increased average participation! The number of events attended per person per year has grown annually by 2.6%. Each of your average participants are attending 13% more of your events today than 5 years ago. These are just a few of the ways that we support you in your mission to grow the motorsport events community. Our team is constantly finding new ways to automate tasks, reduce errors, and increase participation in your events. These tenets are at the core of every new feature we deliver and we're excited to see what you accomplish next! Midwest Cafe Racing Association (MCRA) was one of the first motorcycle clubs to start using MotorsportReg, so what better club to feature for our first motorcycle Pole Position blog! I learned that some things are universal between all motorsport clubs (the accomplishment you feel sharing your passion with a newcomer) and some things have a much more significant impact for motorcycle clubs (weather!). 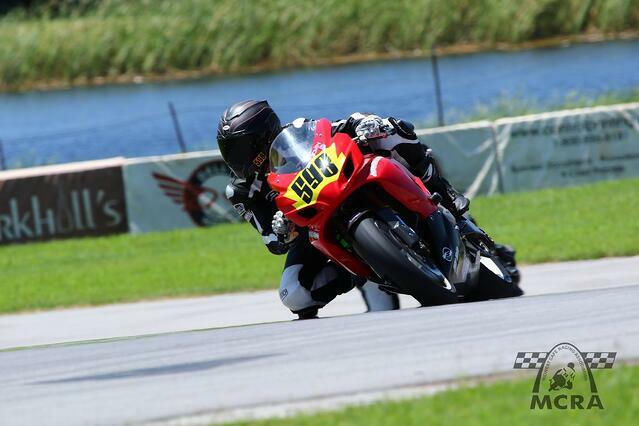 MCRA runs motorcycle track days and racing events in the Midwest area and caters to every level of rider. They offer inexpensive "Test the Track" sessions to help riders experience the track in a safe and controlled manner while also having fun. And their MCRA Challenge Series is keeping motorcycle racing alive and strong in St. Louis and the Midwest. Josh Davis has been with the club for about four seasons. He's experienced everything MCRA has to offer. 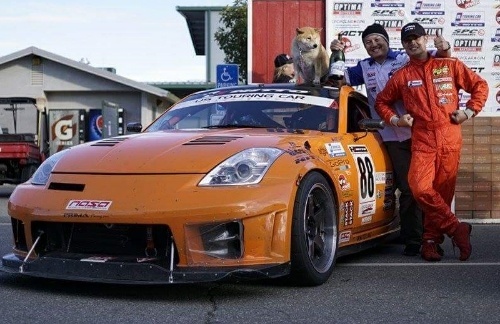 As a customer, he participated in track days, went through the race licensing program, and raced the GT-AM class. He's been on the board of directors for roughly two years (Treasurer) and this season was asked to help coach new riders. He shared with us his passion for his sport and his club. The Summer of 1956 was the first full season of racing at Road America, and it included the Chicago Region SCCA June Sprints on the 23rd and 24th of June. My dad was younger than my 3 year old son, landing on the moon was considered science fiction and a young Mario Andretti had just emigrated to the United States the year previous. A lot has happened since then both on and off the track, but as mentioned on junesprints.com, the WeatherTech® Chicago Region SCCA June Sprints® remains and it’s 61st running makes it possibly the longest consecutively held road race in America. Usually in our Pole Position blog title we highlight a person and their organization. 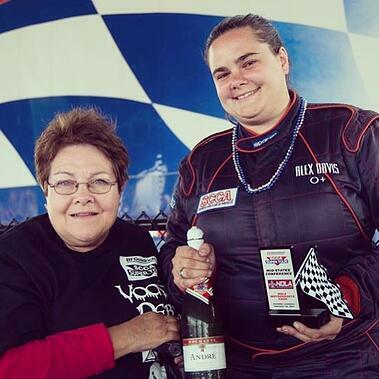 But Sydney Davis is involved in so many organizations that we couldn’t fit them all in - MSR Houston, MSR Houston Charities, Houston Region SCCA, Gulf Coast Vintage Racing Association and SCCA Southwest Division. She’s one busy girl! She graciously took a few minutes out of her busy schedule to share how she runs successful events for so many organizations. Sydney came from a racing family. 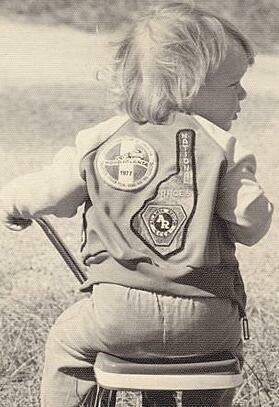 Her dad and uncle started racing back in the 70s, and it's been a way of life since her first race at six weeks old. She wanted to be the first woman to win the Indy 500. But her parents didn't make enough money, so she settled on journalism with the hopes of working for a race team. The opportunity to work at MSR Houston came along and she jumped at it. She’s been there since 2007, starting as an instructor and working her way up the ranks to Director of Events and Schools. In her spare time, not that she has much, she races an E Production Miata in the SCCA Southwest Division. She also enjoys photography, cooking all sorts of things, and making the occasional quilt. And yes, she has made a racing flag quilt. She takes it with her on race trips. 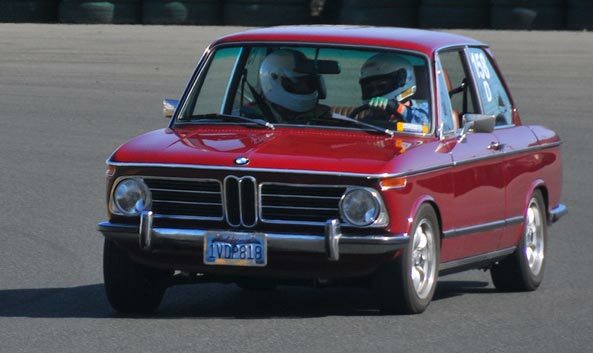 I instructed recently for a new program organized by the Golden Gate Chapter of the BMW CCA. For those keeping notes, GGC was the club for whom I built the original prototype of MSR back in 2002. 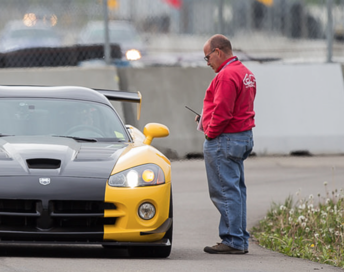 GGC has a successful ladder system that moves participants from low-cost, low-commitment entry-level activities like car control clinics to higher-cost and higher-commitment events like autocross and HPDEs. The challenge they have faced is keeping advanced drivers in their program. Some go on to club racing, some become instructors, but others simply get lost in the vast wilderness that is "open track days". If you're brainstorming solutions to this problem, you might throw out ideas like more track time, better instructors, or more liberal passing, to help retain those experienced students. Those might work but lots of groups do that. GGC tried something totally different. They purchased 7 GPS-based data acquisition units and invited 7 instructors with racing and data acquisition experience (who could translate the squiggly lines into meaningful instruction) to create a personalized "Advanced+" offering. An increased entry fee bought the use of the data system, one-on-one coaching and double the track time to apply and learn from the intensive instruction. 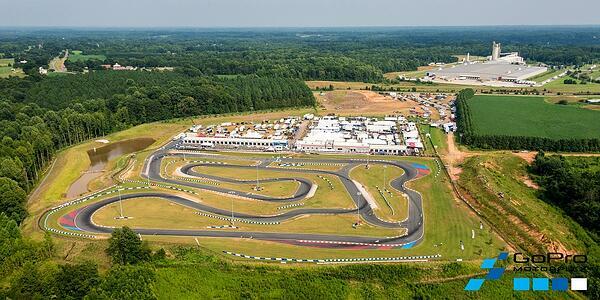 GoPro Motorplex is a world-class karting facility based in Mooresville, NC. A team of karting and racing professionals inspired and motivated by the growing karting business formulated the idea in 2009, broke ground in late 2011 and finally opened the doors of GoProMotorplex in October 2012. As large karting events were added to the event calendar, it became obvious that an easy, customized online registration solution was needed. The team at GoPro Motorplex contacted us and after some face-to-face conversations and training, they started accepting registrations on MotorsporReg.com in the summer of 2013. We sat down with the team to talk about their success running great events.